I picked up a DVD of what I thought was a History Channel documentary on the Third Reich but turned out to be something else instead. 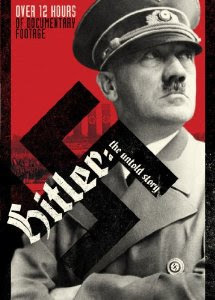 HITLER THE UNTOLD STORY is a six part examination of Hitler and his times. Focusing on the run up to the was war and the war years the film beautifully lays out who Hitler was, what he and his cronies were doing and how the people opposing him reacted to him. The film is told chronologically with the year of all of the events indicated on screen at ll times. I'm a student of the Second World War and I'm constantly trying to find films and books that are going to tell me things that I didn't know before. UNTOLD STORY is full of little moments, small details that fill out events and make history and the story not just the same old same old. The inclusion of these small little tidbits add a great deal and lift up a documentary that on the face of it should have nothing new to say.